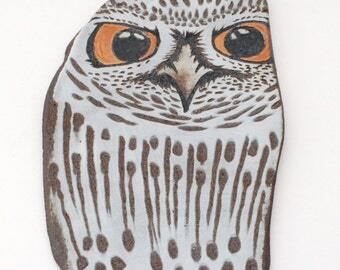 Klaus is a large and slender ceramic owl wall hanging comprised of two lovely shades of blue. His top third is a matte periwinkle blue and his lower portion is a very deep, high gloss navy blue. There is a small portion where the two glazes overlapped, but the deep navy took over, so there isn't much of a color variance in that area. Upon close inspection, that area looks slightly brighter and more saturated. 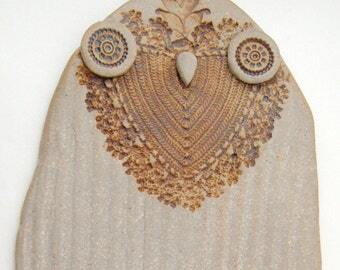 A variety of implements were used to create his surface texture including a beaded belt, fabric lace, rubber stamps and a hand crocheted doily. A lot of this texture can be seen in the navy portion of his body via glaze breaks and the subtle translucency of it. 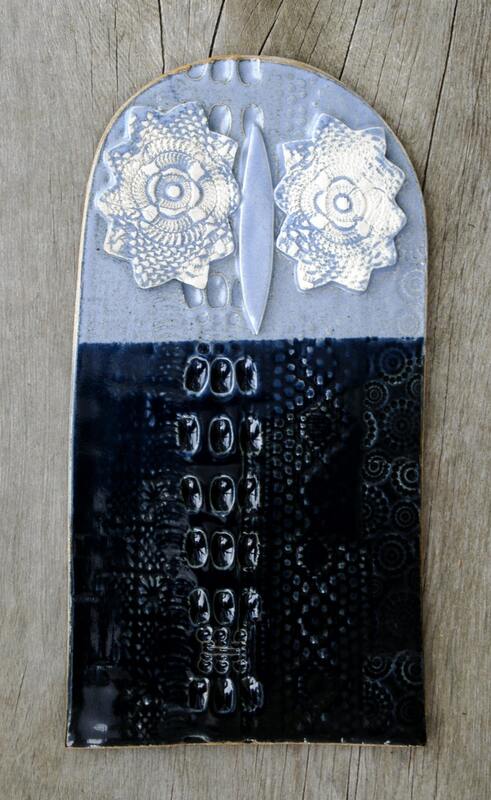 Klaus measures 12 inches tall, 6.25 inches wide and one half inch in depth. 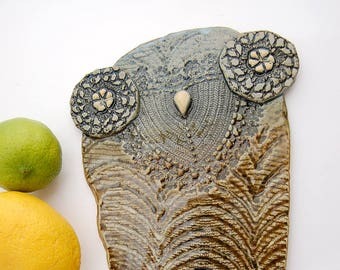 Rustic Stylized Ceramic Owl Wall Hanging - Raptor Wall Art - Stylized Wall Tile - Fine Art Stoneware Home Decor "Carradine"
Ceramic Owl Wall Hanging - Floral Raptor Wall Art - Stylized Geometric Stoneware Wall Tile - Rustic Fine Art Home or Office Decor "Bitsy"